Scotland’s new transport minister has reported that work is “well advanced” on a road contract…that was programmed for completion last spring. Tight site at Pulpit Rock. In fact, the Pulpit Rock scheme was earmarked for completion early this year. Contractor McLaughlin & Harvey has been beset by problems including a very tight site on Loch Lomondside, severe weather and landslides. 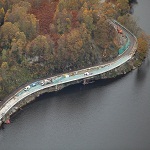 The £5m bypass at Crianlarich by R J McLeod (Contractors) included construction of a new 1.3 km stretch of the A82. The scheme allows through traffic to avoid a bottleneck where the A82 and A85 meet and will enable road users to avoid low bridges in Crianlarich. McLeod will remain in Crianlarich over the coming weeks to complete minor works. Future plans for the A82 include upgrading a 17km stretch between Tarbet and Inverarnan.